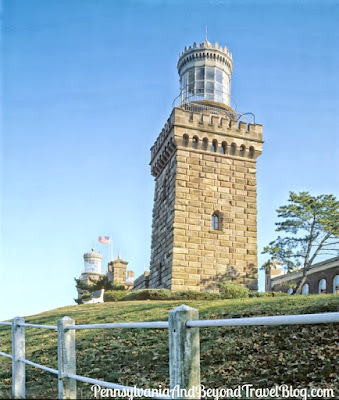 The historic Navesink Twin Lights Lighthouse is located in Highlands, New Jersey overlooking Sandy Hook Bay. If you're unfamiliar with the area, the bay serves as the entrance to New York Harbor and the beautiful Atlantic Ocean. It was built in 1862 and is listed on the National Register of Historic Places. The lighthouse was first automated in 1949 with the north tower being deactivated in 1898 and the south tower being deactivated in 1952. The north tower was then re-lit in 1962. As the name suggests, the Twin Lights are a set of beacons located 246 feet above sea level on the headlands. This lighthouse was an important navigational landmark and guide for ships that were navigating the entrance to New York Harbor. Back in the day, one of the towers emitted a flashing light and the other one a steady light. In 1962 the property was turned over to the state of New Jersey. Over the years the lighthouse has been updated and maintained by the state. The north tower is used as a private aid to navigation and remains active today. The lighthouse is part of the New Jersey Coastal Heritage Trail Route. During the 3rd weekend in October of every year, it participates in the annual New Jersey Lighthouse Challenge. Visitors are welcome to visit the Navesink Twin Lights Lighthouse to visit the lighthouse, museum and on-site gift shop. You can visit their official website for their hours of operation, driving directions, news and events. They're always changing, so I suggest visiting their website before planning your visit.